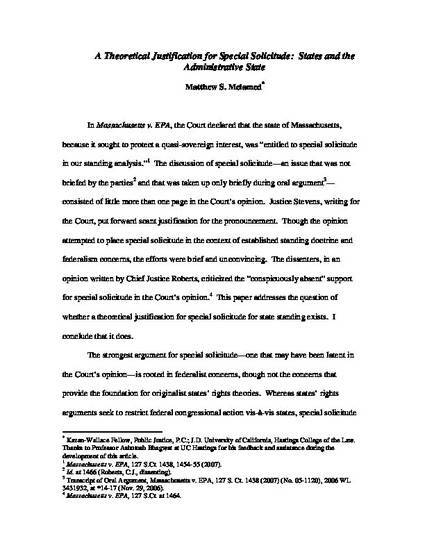 In Massachusetts v. EPA, the Court declared that the state of Massachusetts, because it sought to protect a quasi-sovereign interest, was “entitled to special solicitude in our standing analysis.” The discussion of special solicitude consisted of little more than one page in the Court’s opinion. This paper addresses the question of whether a theoretical justification for special solicitude for state standing exists, and finds that it does. The strongest argument for special solicitude is rooted in federalist concerns, though not the concerns that provide the foundation for originalist states’ rights theories. While traditional states’ rights arguments seek to restrict federal congressional power over states, special solicitude seeks to properly effectuate federal congressional dictates. Special solicitude, through greater access to the courts, provides states a means to protect their quasi-sovereign interests, a means otherwise lacking because of states’ lack of clout in the executive branch, particularly with respect to administrative agencies.  Thus, the special solicitude doctrine can act to ensure states are provided a forum to challenge the non-enforcement or over-enforcement of legislation by agencies that exist to benefit a state and its citizens through federal action. Thus, where Congress has established federal agencies in order to regulate a given field, states have a quasi-sovereign basis for special solicitude in the standing analysis when they seek judicial intervention for the purpose of directing Executive Branch compliance with federal law.